I don’t often get away on holiday, at least not during the summer months. With the poultry growers and the plants to take care of it can easily double the cost of the holiday if you need to get house sitters or relief workers in to manage things whilst you are away. That said this year we did, and we managed to get abroad too albeit just a hop over the channel to France for a week. I can be a bit of foodie at times and enjoy growing, cooking and eating it and as such the French shops and markets provide me with hours of enjoyment as I explore what’s on offer. One thing that always stands out to me is the chicken available in the butchers and meat stalls. It rarely looks anything like the regimented rows of rapid grown commercial stuff you see in the supermarkets. In fact it looks like chickens should look like, a bit heavy in the leg, reasonably plump in the breast but not bulging with white meat, and usually with the odd feather still attached to the visible shanks on the carcass. 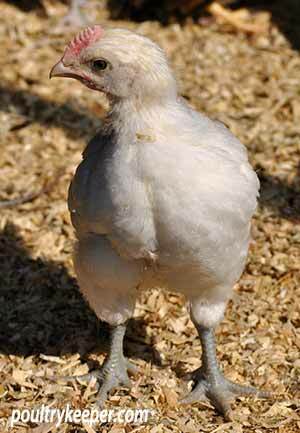 An 8 Week Old Bresse chicken, showing a good sized breast. 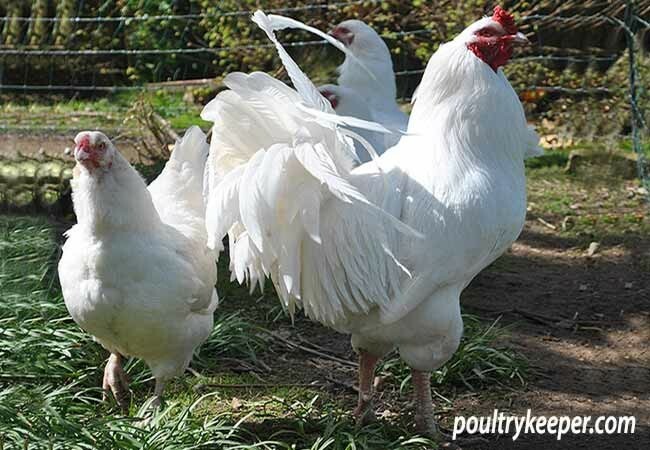 One breed in France though that particularly stands out is the Bresse. It’s also known as the blue footed chicken and as such it is sold with the legs still attached to ensure the buyer is confident of its provenance. For those unfamiliar with breed it is considered by molecular gastronomist Heston Blumenthal to be the best chicken in terms of taste and texture, having reached this conclusion during the research for his BBC series ‘In Search Of Perfection’. The French rear over a million of these birds annually and they command quite a price too (20 euro/kg which works out at about £25 for a regular 1.5kg or 3.5lb chicken) and it’s all down to the exacting standards by which the birds are reared, in other words slow grown and on pasture, in other words no different really than most smallholders rear their birds in this country. I acquired a Bresse chicken a few years back and put it to the taste test against one of my home grown Ixworths and aside from the visual differences there was little to pick between them. As was noted on the BBC Radio 4 Food Programme “How did the Chicken Cross the World” we have the breeds in this country that can compete with the size of the Bresse, we also have the rearing skills and know-how to be able produce meat of a similar taste and texture to the blue foot. The Americans and Canadians have taken the lead from the French and are producing highly prized poultry meat based around the Bresse so it must be possible here in the UK however if tomorrow you tried to sell a 20 week-old 5lb dressed Ixworth for £25, you’d be laughed off the farm gate! A lot of excellent headway has been made on changing consumer attitudes around egg production and whilst principles are all well and good if you can afford them (which could put the British equivalent of the Bresse out of the reach of the average family), it is time we took a closer commercial look at some of the classic breeds we developed for the UK market. Let’s face it, the Ixworth can stake the claim of being “Made in Britain” and back in the 1930’s its creator, Reginald Appleyard, had one end game in mind – the creation of the a breed of chicken that would meet all the needs of the UK market, and I for one think he did a pretty fine job of it. Andy Cawthray AKA Chickenstreet is a self confessed chickeneer who writes for a number of magazines and websites, including the Guardian Blog. Andy also provides talks & courses on keeping poultry at home.